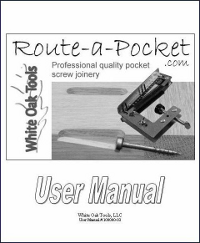 The Route-a-Pocket™ is designed to produce professional quality pocket screw joinery with your plunge router and power drill. The system uses a carbide tipped router bit to machine a low 10 degree screw pocket and a 9/64" diameter drill bit to produce a properly sized through pilot hole for #7 pocket hole screws. Because the pocket is machined with a router bit, there are no featheredges and virtually all tearout is eliminated. The low 10 degree screw angle helps to maintain flush joints during assembly and enables greater screw penetration. I try to hide my pockets by placing them in areas that are seldom seen, why make them look nice? To us at White Oak Tools, this is a puzzling question. Hidden or not, since when do woodworking professional and hobbyists not take steps to avoid predicable tear-out? And more importantly, why limit an easy to apply joining technique to areas that you hope will never be seen? For example, save time by using Route-a-Pocket™ Joinery when assembling cabinet doors. By placing a single low angle deep penetrating pocket screw across a joint made with matched rail and stile cutters, clamps are no longer needed, glue clean up is easier and wide doors gain much needed reinforcement. Leave the clean-cut professional quality pockets exposed for all to see when the door is opened, or make the joining technology unnoticeable by inserting perfectly matched plugs using the optional Route-a-Pocket™ Plug Cutter. It takes less than 30 seconds (including clamping and unclamping) to make a pocket using the Route-a-Pocket™ jig and when complete you’ll have a stronger joint that is easier to make flush (less sanding) and does not need to be hidden. Workpiece thickness range: 1/2" to 1-1/2"
Don't forget to also watch the Plug Cutter in Action!